Black Forest Cake is one of the most popular kinds of cakes, so indulge in the flavored coffee version that features flavors of ripe maraschino cherries and chocolate. 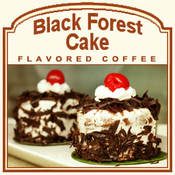 Made with 100% Arabica beans, this Black Forest Cake flavored coffee is roasted to satisfy your sweet-tooth with its decadence. With only 2 calories per cup, this is a dessert coffee you can truly indulge in. A heat-sealed valve bag will ensure the freshest coffee possible, which is why we roast and ship on the same day. 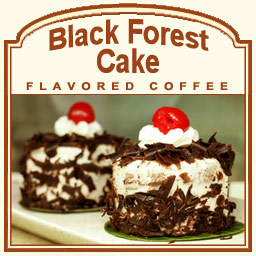 Enjoy this Black Forest Cake creation � it will melt in your mouth with its luxurious full-bodied flavor.